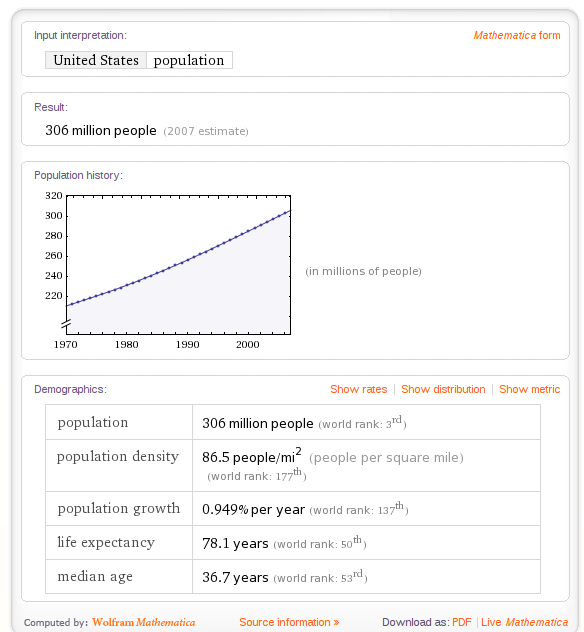 I've spent a fair amount of time using Wolfram|Alpha recently. Here are my impressions. The comparions to Google were immediate and plentiful. After all, Google describes their goal as making all the world's information searchable and catalogued. However, Alpha is not Google. Here the term computable can nearly be thought of as making all of the data formatted in such a way that the computer can read, evaluate, and manipulate the data. A great example of this is to do something like produce a graph for a data set over time (such as population). Google, on the other hand, is best used as a catalogue that ultimately points you to data. It does very little of it's own analysis other than what is required to build their index. Alpha is a calculator, only a calculator that can understand natural language, access the relevant data and present it in a form that is easily understood by humans. As such, it's an interesting tool. Alpha's ability to display data on a webpage is particularly impressive. Take a look at what you get when you query Alpha about the International Space Station. 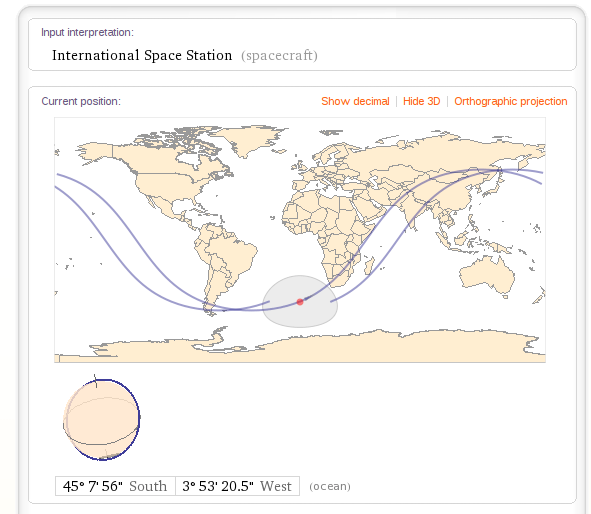 Alpha displaying the current location of the ISS. The results are impressive when Alpha knows how to handle your input. In the cases where it doesn't (and there are many) leave much to be desired. For instance, searching for general terms does not yield much beyond basic information, and sometimes that information is only related to the core concept. Consider the next image where I searched for Computer Science. The result is no information other than some queries that Alpha can display results for. Alpha's results for the term "Computer Science." 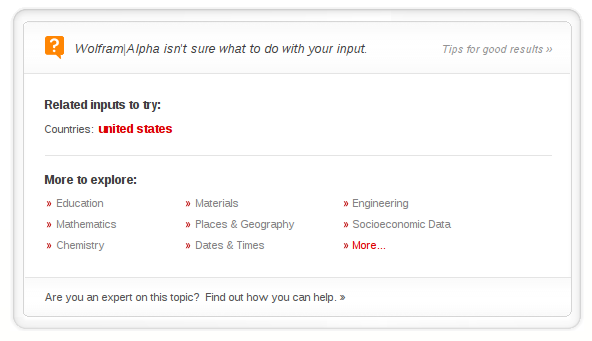 If you are interested in results that are analytic or mathematical in nature, Alpha might be a really good resource. For encyclopedia like results, Wikipedia still rules the day. Of course, Alpha is not positioning itself to compete with Google or Wikipedia, but I think the comparisons are fair along the lines that all the mentioned services intend to provide information to people seeking information. 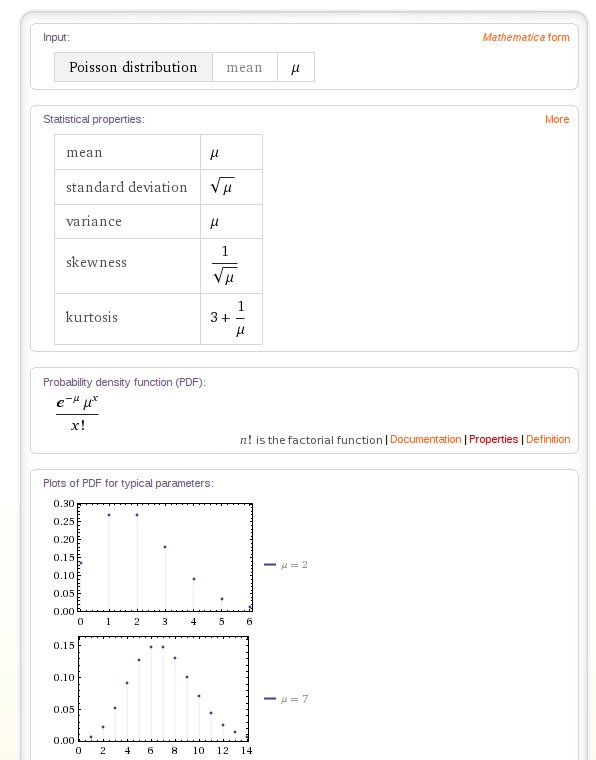 This brings me to the question, "exactly how useful is Wolfram|Alpha?" I though this might be the type of question that Alpha itself could help me answer. I started by searching for information about the United States' current population. These results are good and quite useful. Now, I wanted to get some information about education in the US. Not as much as I'd like to see, and the numbers are a bit out of date. Here I'm a little dissappointed. I'd assume that certainly raw numeric data such as this could be computed upon to reach more conclusions. In my next search, I try something a little more advanced: let's try to calculate the current portion of the population that has obtained a college degree. This should be a simple calculation, given the data. The term for this value is "education attainment," something that I learned through a Google search that lead to the US Census Bureau's page. Nothing. Ok, maybe I need to be more verbose and use terms that I know already lead to data. So, I searched for "education usa, population usa." What? The calculation isn't even complete. 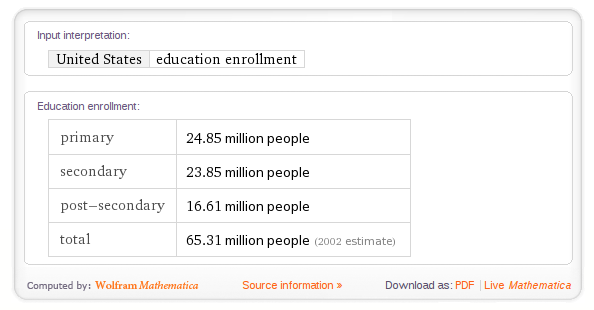 Education enrollment has no result, even though I've already found those numbers before. Even if all the numbers had appeared, no useful calculation or comparison has been done. The number that I'm actually searching for is 28%. This represents the portion of the population over the age of 25 that has obtained at least Bachelor's degree. This information comes from a Census Bureau page that turned up in a Google search. It would have saved me a lot of time if Alpha had produced this number. Given the data that it has access too (US Census Bureau is listed as one of Alpha's resources), the calculation is fairly straight forward as well. The reason I'm searching for this number, 28%, is that I believe that the majority of people interested in the types of results Alpha can provide likely have a background in mathematics or science. Most of the impressive results are related to these fields. This is not hard to understand when you realize that "computable" human knowledge is much more likely to come from these fields than say, literature. Compare the results when searching for Poisson distribution to Gulliver's Travels. I think you can see the vast difference in the quality of the result returned. Now, back to that 28% number. I'd assume that people with a background in math or science are likely to have a college degree. Of the people with a college degree, only a portion will have studied math and/or science, but let's just keep using the 28% number. 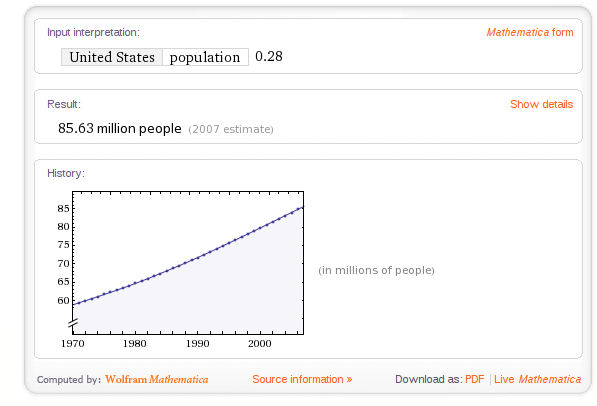 What is 28% of the US population? Alpha can answer that. The number: 85.63 million people. I'd conclude that this is a high estimate of the number of people who might ever be interested in the Alpha project. I think the majority of the population might type a query, get a graph, determine this is not what they want and move on. People who are interested in these types of results will likely want to dig in deeper, as I tried to do above. I think at that point they will become disappointed in Alpha's inability to understand what information they are trying to elicit. Further more, if they are able to obtain just the data they need, I wonder of what use it is other than as a cure for their own curiosity? It is difficult to impossible to determine where, exactly, Alpha got the source information it needed to reach its conclusions. Even if this source information was available, the user still has no idea exactly what equations, algorithms, or process was used on the data. Without this information, I find it difficult to believe that anyone would be able to use Alpha's results in any sort of document or report. I think a fundamental improvement to Alpha would be to return precise source information that ultimate points to the raw data along with a bit of Mathematica (or other) code that performs the calculation. Then, the user could take this information, verify its validity, modify it as necessary, and incorporate it into their own work. Until this is possible, I'm afraid Alpha will only be used for curiosity's sake. Despite these criticisms, I find Alpha to be a fascinating project, if only for it's data presentation and cataloguing engine. The project is in an early stage, so perhaps the flaws I see are simply due to this. Perhaps the desired features are already in the pipeline. 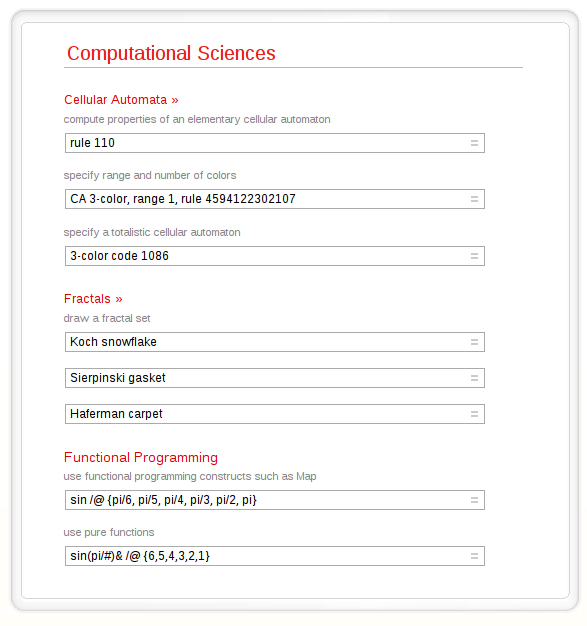 I hope that they are, because I'm a fan of what Wolfram is trying to do here. If they can improve the project to the point where these points are no longer an issue, I can see Alpha becoming the world changing product what Wolfram would have you believe it is. Until then however, you might be better off searching somewhere else. In the programming language Scheme the concept of infinite lists can be implemented using streams. A stream is really nothing more than a cons cell that contains a value in the cdr field and a pointer to some code to generate the cdr field. While simple in design, the concept is powerful, allowing the programmer to create infinite sequences by simply defining a function to generate the next value in the sequence. Python supports a similar concept in the form of generator functions. The implementation here is a little more complex, but it can be thought of as a function that returns a result, but maintains its current state for later execution. In this code, a new stream is created to filter out the unwanted multiples from the previous stream. In both cases, we've exhausted the language implementation's ability to hold the data structures necessary to represent the lazy lists. The result is elegant code that fail rather quickly. Now, we could always buy ourselves a little more execution time by increasing the heap for Scheme and the recursion depth for Python, but that will only take us so far. So, that leaves me wondering: is there a similarly elegant way to write code of this sort that won't expire so quickly? To clarify, I'd like to keep using streams and generators, but find some way to limit the overhead incurred from the creation of so many filters (1 for each prime!) without resorting to a different algorithm. This procedure is still recursive (primes uses prime? which uses primes), but has much less memory overhead -- I managed to generate primes much larger than the 1000th without hitting memory limits. However, this solution strikes me as not quite the same in spirit as the first. Here, a given integer is tested by comparing it to the current list of generated primes while the first definition is building up a function to generate the next prime without having to explicitly scan the list of the already generated primes. This week at the CES, Palm announced its newest software platform and the smartphone to go with it. Personally, I'm impressed for a variety of reasons. First off, Palm has put together a stunning hardware and software package. Check out some of the videos (another) of it in action. It's slick and intuitive, which is definitely what Palm needed to pull off for people to pay any attention to them. As one journalist stated, "my iPhone suddenly felt old and played out." 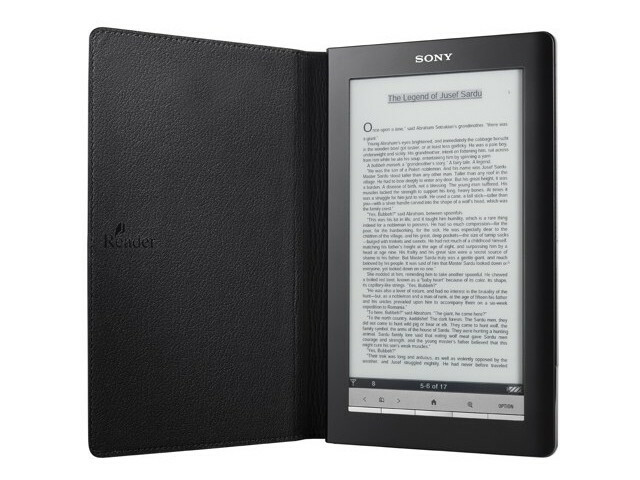 What better praise could one have for a new device? From what I saw, there are three things that really caught my attention. The first is what Palm calls "synergy," which is really the phones ability to display related information in a single interface. As an example, the messaging application shows messages from all sources (sms, aim, whatever) in the same thread. You don't need 3+ applications and interfaces to communicate with only one person. On a mobile device, this seems like it will play out to be a huge advantage. The second thing is the phone's ability to multi-task well. Applications can run in the background (something that the iPhone does not currently allow) and bring up notifications when events occurr. This in and of itself is not that innovative, but I think Palm's card metaphor for managing applications and interfaces is. It seems to work well given the capabilities of the device. The third thing that caught my eye is how well the interface works with gestures. I really like the idea of having a small gesture area below the screen so users can give input without having to worry about accidentally clicking buttons or activating other functions. On top of that, the whole system seems to work well as a touch driven device. Even though I like gestures and a multi-touch screen, I'm really glad they included a physical keyboard. All of this combined seems like it will really work well on a mobile device. So the actual device aside, there is another aspect of the event that is interesting to me: the press reaction. Before the announcement, everyone seemed to be commenting on how much of an uphill battle Palm had before them. 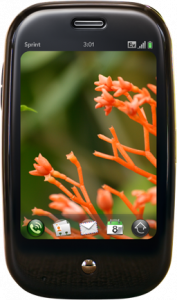 It had been a long time since Palm was viewed as a player in the cutting edge smartphone market (at least in the US). It seemed that a lot of critics felt it would be an almost insurmountable challenge for Palm. At the moment, a few days after the announcement when (to my knowledge) no one outside of Palm has actually held the device, the response of the press seems overwhelmingly positive. I think Ars Technica came up with the best word to describe the situation when they called it a resurrection. If anything, this device might be famous for how quickly it changed the outlook for Palm as a company struggling to survive in a market that is becoming more and more crowded with big players like Apple and Google. Sites are already posting comparisons between the iPhone and G1 and already (again without any real hands on time) they are showing the Pre in a positive light. I had hoped that Palm would have something strong to show, but I didn't expect so many journalists to become so entralled with the phone so quickly. Outside of Apple, this sort of thing just doesn't happen that often. My hope is that Palm takes advantage of it while positive forces are aligned on their side. From what I can see, there are two outstanding issues that, potentially, could become game changers. The first is price. All of this will be no good for Palm if everyone ends up loving the device but doesn't buy it because it's too expensive. They really need to think this one over before the announce the price, especally given the way the economy has turned out and the strong competition (which seems to have taken advantage of carrier subsidies). My thoughts are that Palm should launch the Pre with a low price. If they don't gain marketshare fast, I think the Pre might slip from the limelight. Closely tied to the development tools is the applications distribution service (assuming they create one). I think Palm should build one, but that it definitely should not be exclusive. In other words, developers should be able to use a Palm app store to easily sell their software, but they should not be prevented from selling through other outlets or simply giving it away for free on their homepage. I would hope that Palm has been in the PDA/smartphone buisness long enough to realize this, but I suppose there is always the temptation to follow Apple's (flawed, imho) app store example. In the end, I'm really impressed by what Palm showed off and I wish them the best of luck going forward. Despite the positive reaction, it seems that Palm still has an uphill battle ahead of them. I hope they make it to the other side, because as it stands now, I don't think I'd mind having a Pre in my pocket. Update: Here is a link to a video of the entire presentation of the Pre at CES. The middle of the video has a really good demonstration of the UI features and interaction with the device. More than a few months ago, Richard Stallman commented on cloud computing and made some striking remarks. I understand why Stallman said what he said, however I think he’s looking at the problem from only one direction when it should be viewed from multiple directions. Stallman’s position is that “cloud computing” equates to handing your data over to organizations/systems that are out of your control. In many cases, this is absolutely true and even dangerous. To this end, I say that when using apps in the cloud, one should make sure that there is some, relatively painless, way to export all of the data that the application may have. I think Google Mail is a great example of an application that makes retreiving your data easy, chiefly by supporting known standards (namely POP and IMAP) and providing export functions for things like your contact list. For this reason, I feel pretty comfortable letting Google manage my mail for the time being. In return, I get some nice things that would be difficult to provide on my own, such as really powerful search, a consistent interface no matter what computer I use, and replication of my data with copies likely spread to multiple physical locations. Now, where Stallman starts to make a lot of sense is when you consider organizations and users that need to have absolute control over their data. You can’t get this with a cloud application by the very fact that you don’t control (Stallman would probably say own) all of the software and the systems that are managing your data. This, obviously, can be a big problem if you need to make guarantees about the system to your customers. In general, I try to remain aware of the above concerns. The reason I like Open Source Software is that I feel it empowers users. It is wonderful to know that you don’t have to pay a tax to any set of companies in order to use the hardware that you own to its fullest potential. Computation is much too important to have it controlled by any limited set of corporations or people. Stemming from this follows the support of open standards and formats. I don’t want my data to be locked in to some format that can only be manipulated by program X. Carrying this idea forward, I see a large opening for cloud computing. What Stallman failed to realize is that the concept of cloud computing can be used to provide greater access to the data that I do control. To me, cloud computing, at its heart, is about making users’ data more accessible. Why should this idea not carry over to the data on my desktop system? Why should the software that I run not be able to take full advantage of the Internet and the connectivity it provides? Following with Stallman’s central argument, I think he would favor some way of sharing photos online other than using a service such as Flickr. But to a large portion of the users, I think, the main draw of a service like Flickr is the community. I could always share my photos by running my own web site that simply provides a way to navigate through my images, but this misses the point. What I think should be investigated, for example, is some way to take the photos on my computer and have them, without effort, become part of the cloud. I don’t lose control of what I’ve created and what I own, but others are able to access my data, comment on my work and, generally, participate in a community. I think this blog post by Google gives good insight to the sorts of advantages that cloud computing brings. In coming years, computer processing, storage, and networking capabilities will continue up the steeply exponential curve they have followed for the past few decades. By 2019, parallel-processing computer clusters will be 50 to 100 times more powerful in most respects. Computer programs, more of them web-based, will evolve to take advantage of this newfound power, and Internet usage will also grow: more people online, doing more things, using more advanced and responsive applications. By harnessing the power of a collection of computing systems, interesting things can be accomplished. What I would like to do, is be able to plug my system into the cloud. Instead of having to sync my smartphone with my system when I’m at my desk, my phone should simply have access to my data, no matter if that data lives in a box under my desk or a server in Google’s cluster. Access should be seamless and updates should be available on every system, without me having to connect a cable to each one individually. If I add a contact on my phone, I should be able to view that data on any device that has access to the web. This is what I’d like to see cloud computing bring to the table. If the open source / GNU community doesn’t recognize this or attempt to support it, I think they will be doing their community a disservice. Open source software can make an impact by making cloud computing more peer-to-peer rather than the largely client-server mode that it has currently. The open source movement would likely not exist if it were not for the Internet, so it would seem counter-culture to not make an effort to support growing connectivity to the next level. What could be more open than that? Those who are interested should read this article on Ars Technica for another opinion that mirrors my own as well as to see how some current open source projects are embracing the idea of the cloud. The story is that the following is the eggnog prepared for President and Mrs. Clinton while they were in the White House. I've tried it and verified that this recipe is too good not to share. Combine yolks and sugar in bowl and beat to ribbon stage. Store and serve very cold - blend well bevore serving.